First published Canberra Times 22 February 2012. With the low carb fad that’s been around for the past few years, pasta has definitely been placed on the ‘B’ list in our house, along with bread and potatoes. For some time now we have been dutifully eating our protein and vegetables without carbs. That is until recently, when I unpacked a long lost box of kitchen items that had been stored away and rediscovered my pasta machine. Chef Giorgio Locatelli reckons that every authentic Italian is made up of two-thirds pasta and that pasta is the fuel that keeps Italy running smoothly. He also wonders that at ten to midday in Italy, how many millions of kilos of pasta are being placed in pots of boiling water ready to be transformed into lunch before siesta? Sophia Loren famously claims she owes her voluptuous figure to spaghetti, and Garibaldi vowed that it was pasta that united Italy. With this level of devotion, and despite a lingering fondness for spaghettio’s out of a tin on white toast, Australians have become pretty sophisticated in the subject of pasta and embraced the bow ties and spirals with gusto. Although we are likely to reach for whatever tin of tomatoes or dried pasta is available to us in our cupboards, Locatelli says that the different shapes and textures of pasta are meant to match their sauce. He instructs that you would not use penne to go with a tomato based sauce, you would use spaghetti. Similarly, you would not use spaghetti to make a cream based dish. There also seems to be a number of unspoken rules around dried and fresh pasta. Locatelli further instructs, you would only use fresh pasta to go with a ragu style sauce. He believes that Italian mothers and grandmothers just ‘know’ these things and it is purely instinctive. So many rules! I’m feeling pretty confused by now, and resign myself to accommodating the harvest from my vegetable patch. It seems that I’m one of the lucky ones to have ripe tomatoes, which was more good luck than skill. So I bend the rules a little, deviating from tradition, with a sauce made from fresh, sweet cherry tomatoes mixed through a home made fettucine style pasta. 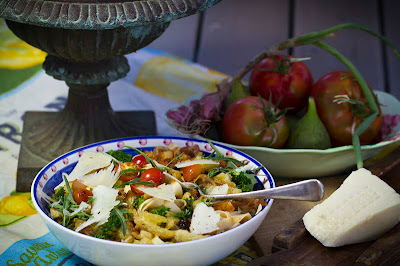 I topped it with a pangritata, which is a garlic, herb and breadcrumb mix fried in olive oil. Over the ten years I’ve owned my pasta machine and as many times that I’ve actually used it to make fresh pasta, I am reminded that it really is so easy to make. Although for me, it’s the sense of satisfaction to see it bubbling away in the pot that really does it. Then of course there is the fantastic eggy flavour and the silken texture, comparatively difficult to achieve with the dried variety. When I made my pasta, it was early in the day. I then hung it over the rungs of a clothes airer, secured behind closed doors in the laundry, so the resident food focused spoodle would not be tempted. 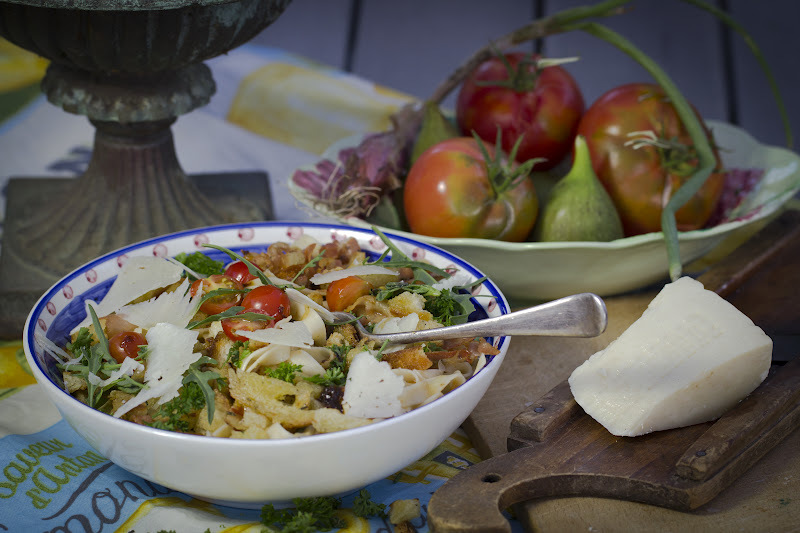 You can store the dried pasta for months in the cupboard in airtight containers or bags if you dry it properly. Alternatively, if you are using your pasta straight after making it, you can wind handfuls of it into little nests and store them under a damp tea towel to stay moist before you are ready to cook it. Pasta making, like breadmaking, is the kind of thing I wouldn’t choose to do if I was in a hurry or not in the right frame of mind. If I was either of those, I would succumb to the instant variety and reach for a packet in the cupboard. In saying that, I highly recommend giving pasta making a go, it’s incredibly easy and therapeutic, not to mention the sense of achievement and excitement you will feel when you tell people you made it yourself. Place flour in a large bowl and make a well in the centre, add the eggs and yolks. Mix with a fork, breaking up the eggs as you mix the flour in from the middle. Mix until the dough forms a ball and you can work it with your hands. Tip out onto a clean, floured surface and knead well until the dough ball comes together and is silky and elastic. Wrap the dough in plastic wrap and rest in the fridge for half an hour or so. I use a pasta machine, but if you don’t have one you can roll the dough by hand, however it is a tough job and takes a lot of rolling to get it as thin as a machine can. A machine really is great if you can lay your hands on one. They are not very expensive and worth it if you love your pasta. Divide your ball of pasta into 4 pieces and keep covered. Working with one ball at a time, dust the pasta ball with flour and flatten out by hand. Run it through the widest setting on your pasta machine. Do this 5 or 6 times, incrementally reducing the thickness until it is on the thinnest setting. You will get the hang of it once you do it a few times. Once I have a long thin sheet I then run it through the fettucine setting to make the long flat noodles. Use one hand to lift the noodles as they come out of the machine and one to turn the handle. I hang the noodles on a clothes airer to dry for a few hours. You can hang them over the back of a chair, just remember to cover the chair seat with a tea towel as the noodles will be coated in flour. If you are using them straight away, just twirl each portion into a nest and store them between two damp teatowels while you are boiling your water ready for cooking them. They will stay fresh like that for a few hours if you store them in the fridge in the teatowel. Repeat with the remaining portions of pasta dough. Tip: keep the balls of dough coated in flour along with the fettucine noodles once they are cut. This will stop them from sticking together. First cook the pangritata. Place the olive oil into a hot large hot frying pan. Add the garlic, thyme and bread. Fry until they begin to go golden. Stir around for a couple of minutes until they are crisp. Season with salt and pepper and drain on kitchen paper. Cook the fettucine in salted boiling water until al dente and drain. While it’s cooking, place the oil and garlic in a frying pan (use the same one you used earlier) and heat gently. As the garlic begins to soften, add the anchovies and mix gently. They will melt into the mixture. Add the lemon juice and the chillies. Toss in the drained fettucine and coat it in the sauce. Taste for seasoning, you find you will need a little more lemon juice. Serve immediately sprinkled with the pangritata and a little parmesan. I’ve fed, talked and sang to them and even visited them in the night. I almost cried on them when I found a few viciously attacked, with their skins pierced and their innards scattered. After the attack, my prolific fig tree was happy to wear a protective white tulle dress, resembling a female nurturing her young. My figs have only just ripened, carefully tended over the spring and summer, now showing their plump green and purple bodies to the sun together with a subtle scented muskiness. For my first harvest, I fill a small bowl, straight from the tree, still warm from the sun, and it made me happy. With its droopy branches and pendulous ripe figs, it also hides hundreds of baby figs within its leaves with the promise of another harvest in a few weeks time. There is something simply irresistible about this ancient fruit, originating in the Middle East and Mediterranean regions, that many believe descends from a place called paradise. Although, I love fig jam, it’s a shame to spoil such perfection by cooking these beauties down to a paste, particularly when it’s the first harvest of the year. I have great plans for my future harvest that hints of chocolate and vanilla. 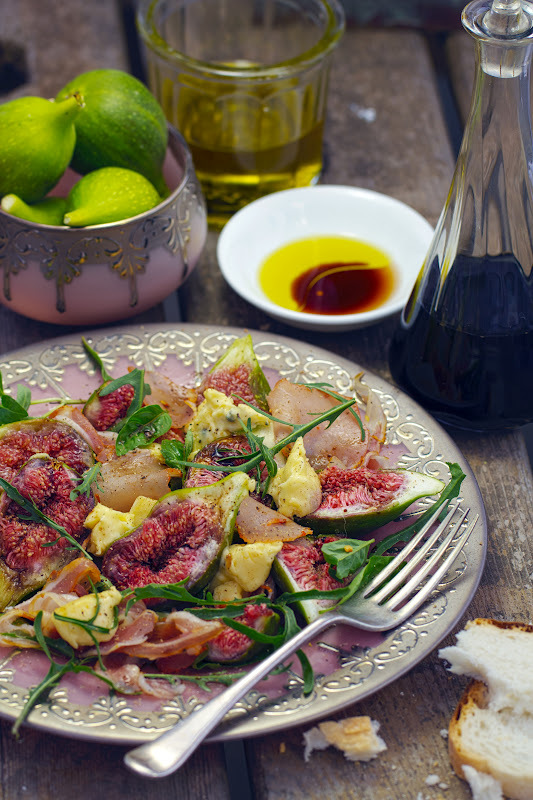 I prefer to use the figs whole, so I prepare a fresh fig salad using basil and wild rocket grown from the vegetable patch together with some good quality proscuitto, a creamy blue cheese and an aged balsamic that perfectly complements the sweetness of the figs. Choose the best quality ingredients you can find and be generous with the balsamic vinegar and olive oil, as it needs to be seen and tasted. 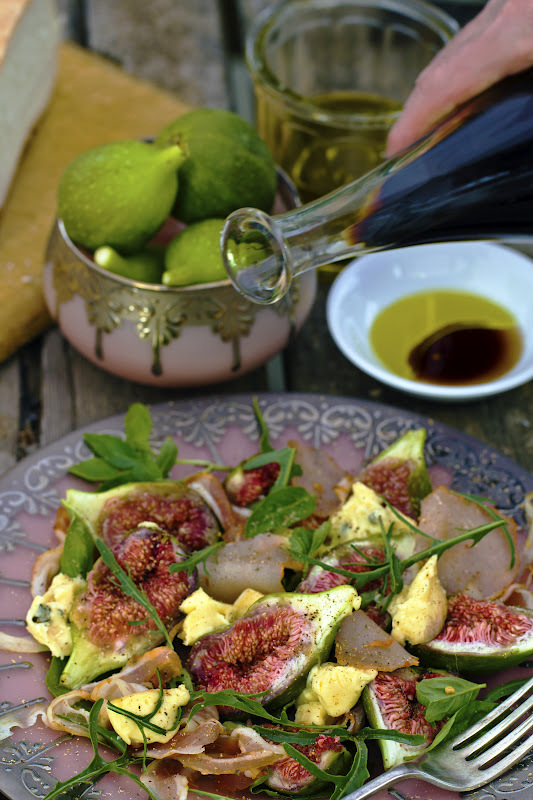 The beauty of this salad lies in its simplicity as further trappings only distract from the figs pristine perfection. Just add some warmed crusty Italian Sourdough to mop up the juices. This salad is great as a light entrée for 4 or a light meal for 2. Cut a cross in the base of the figs, then push up from the base to open out a little. This allows the dressing to penetrate the whole fig. Place the figs on a serving platter. Crumble the blue cheese and tear the basil leaves and scatter around the figs. Drizzle with the olive oil and season with the nutmeg, salt and pepper. Tear the prosciutto and tuck around the figs, cheese and basil. To serve, drizzle with the balsamic vinegar and mop with the crusty bread. First published Canberra Times February 8, 2012. 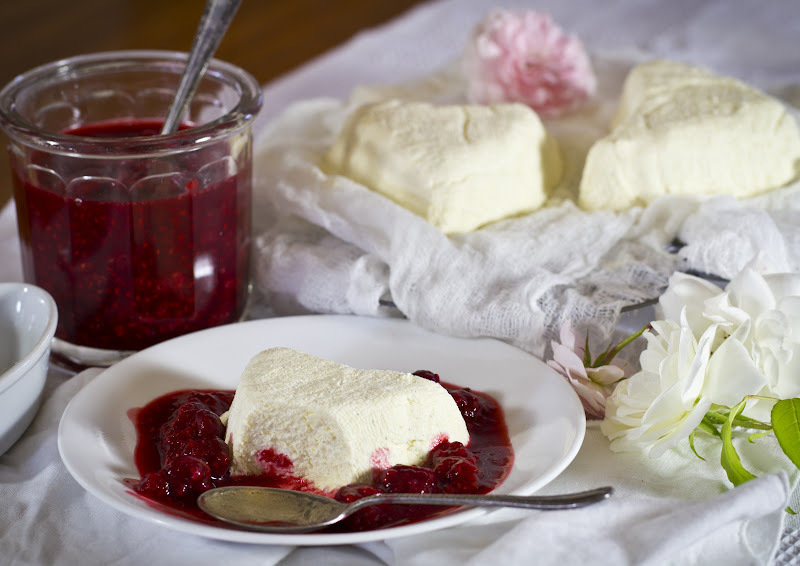 If you’re out to make an impression on Valentines Day, the luscious and very French Coeur a la crème with raspberry coulis might just give you the edge. A picture of pure white cream floating in a scarlet sea of raspberry coulis, makes a voluptuous statement, perfect to impress the object of your desire. Despite its glam looks, it’s an easy dessert to make and the most basic of cooks can achieve excellent results by following the recipe step by step. The windfall here is that you won’t even need to turn on the oven. You do have to be a bit organised for this one, as you’ll need to make it at least one day before your guerre de l’amour begins. To ensure your campaign’s success, it’s important to have the right materiel on hand. You will need about ¾ of a metre of muslin or cheesecloth, as the cream cheese is moulded into shape and wrapped in muslin, then left to drain in the traditional French way. This will take about 24 hours in the fridge. To make my dessert, I used a set of four 7 centimetre heart shaped Coeur a la crème moulds that I bought during my travels in France last year. They have small holes in the base to allow the liquid to drain from the cheese. The heart is the traditional shape for presentation of the dessert, although there are as many restaurants now serving it in freeform shapes too. You can purchase these moulds through online outlets or specialty kitchen shops. If you don’t have the moulds, you can just as easily spoon the cream cheese into the muslin, creating a freeform teardrop shape, which bears more of a likeness to a true heart in any case. The shape will not make any difference to the end result. This quantity makes four individual portions. So, if you serve this to your Valentine, and don’t achieve the success you desire, you will have two left in reserve for further sorties. They will keep for 3 to 4 days in the fridge and I find that the flavour improves the longer you leave them. Alternatively, leftover portions can be wrapped in the muslin, placed in a freezer bag and frozen. Any leftover raspberry coulis can be used to drizzle over ice cream or yoghurt or kept frozen for later use. Tip: Muslin or cheesecloth can be bought at fabric shops very cheaply or Wheel and Barrow sells food grade muslin in packs for approximately $7.00. Make sure all ingredients are very cold. The ceramic Coeur a la Crème moulds retail in Australia for about $20.00 each. Cut the muslin into 8 squares, approximately 20x 20cm size. Wet the muslin squares under cold water and line 4 Coeur la crème moulds with 2 overlapping layers of the dampened muslin, letting the excess hang over the sides of the moulds. In the bowl of an electric mixer fitted with a beater attachment, beat the cream cheese until it is smooth and velvety, scraping down the bowl as needed. Gradually beat in the sifted icing sugar, vanilla, lemon juice and rind and beat again until very smooth. You will now need to scrape the beaten cream cheese mixture into another large bowl. Again, using the mixer bowl, (no need to wash it) fit the whisk attachment to the machine and whip the pure cream until it just holds stiff peaks. Using a spatula, gently stir a small amount of the whipped cream into the cream cheese mixture to loosen it, and then add the rest of the whipped cream, folding in gently with a spatula to hold the air in. If using the moulds, divide the mixture among the individual moulds lined with the damp muslin. Fold the excess muslin over the top and pat gently to ensure it settles to the bottom. Place the moulds in a tray in the refrigerator to catch the liquid that will drain. If you are not using the moulds, for each serving, place 2 squares of damp muslin, one on top of the other, on a clean work surface. Place 2 to 3 tablespoons of the cream cheese mixture in the centre of each piece of muslin. Gather the muslin up and tie the top with a small piece of string or a rubber band to make 4 teardrop shaped balls. Repeat for all four servings. Set the balls of cream cheese in a strainer over a bowl to allow them to drain. Place the moulds or balls in the refrigerator overnight for at least 12 hours to drain and dry out. I find leaving them an extra day provides an even better result. But this is entirely up to you. To make the coulis, place half of the raspberries in a bowl and mash gently with a fork or potato masher until only just crushed. In a medium saucepan, combine the mashed raspberries, whole raspberries, sugar, lemon juice and alcohol if using. Place over medium to low heat and gently simmer until the raspberries have softened and begun to release their juices, about 5 minutes. Cool completely and set aside or refrigerate until ready for use. When you’re ready to serve, unfold the muslin from the tops of the cream cheese moulds and lifting carefully turn the cream cheese out onto individual plates. If using the teardrop shapes, cut the string or rubber bands and peel away the muslin and plate up. In both methods, the muslin will come away easily without sticking. Spoon an indulgent amount of the raspberry coulis around the cream cheese to serve. With the Christmas frenzy behind us, I find myself sucked into the vortex of the New Year, vaguely wondering what happened to that restful and restorative time I had so looked forward to. Now, with normal service resumed, it seems I really didn’t slow down at all and that last year’s craziness just rolled on through. Was it with a kind of inverted sixth sense that I wished friends and family a peaceful and restful time in the flock of seasonal cards I dispatched in the weeks before December 25th? Perhaps I sensed what I was getting myself into and subconsciously hoped that the wishes I directed to them would come back to me too. The Christmas food preparation that occurred in my kitchen over that intense and frenetic period of time reminds me of a silent movie. People stagger in and out of the kitchen at double time, preparing and dispatching food in exaggerated quantities, only to return seconds later with stacks of empty dishes. This process starts all over again immediately, like La Grande Bouffe on fast forward. The rolling assembly line felt like it went on for weeks, but in reality only lasted 6 days. Despite all my gripes and ensuing exhaustion, the great thing about this frenzied time was lots of interesting food combinations went out, some worked and some didn’t, but they all provided food for thought. Back before the masses descended, I shopped on an industrial scale to prepare for the onslaught of hungry visitors. Eliminating the slightest risk of anybody starving while on our watch was my strategic objective. The equally staggering amount of food that people brought with them was not factored into the plan. So, when it’s time to say goodbye and the caravan slowly rolls down the road, I find myself waving them off with a mince tart in one hand and a chocolate Santa in the other. With a huge sigh of relief, I go back inside to return the house to some semblance of order, open the fridge and a cluster of rum balls tumbles out, cascading off the stacks of leftover ham, slow cooked pork, lamb & ribs, the “spare” vat of creamy baked potatoes, the three rustic Italian loaves and the cranberry and coconut Christmas pud. They inevitably roll into every inaccessible corner of the kitchen. I stand there among the disaster of chocolate and coconut, staring at the blinking Christmas tree, Bing still crooning smugly from the stereo, buried somewhere under tinsel and crumpled wrapping paper. Just for a change of pace, we invited more people over to help us eat through the mountain of foods. While thinking about dessert and some inventive ways to use up leftover ingredients, especially the cartons of cream that I didn’t want to waste, I remembered a cool sweet made for me by a friend on one of those seemingly rare hot Canberra days. 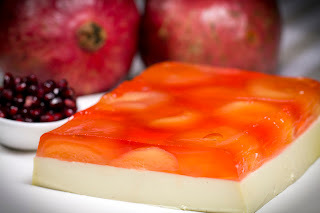 The criteria it needed to meet included: must use leftover fruit; can be prepared in advance; can be stored in the refrigerator (the bulging freezer was not an available option); must look smart. This gem satisfies on all fronts and looks sensational, bringing gasps of rapture from all assembled. 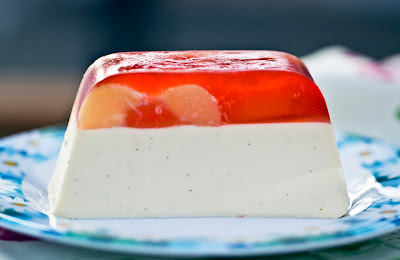 This is my version of the perfect peach, plonk and pomegranate pannacotta. Don’t be scared of making this dish, working with gelatine is very easy and will impress people for sure with its looks and taste. My tip for this dish is that when unmoulding the pannacotta, only leave it sitting in the warm water for 1 minute and if it still holds on tightly, leave it sit for an extra minute out of the water. My version served about 10 people, you only need a small slice as it’s quite rich. Pour the water, sparkling wine and sugar for the Fruit Jelly top into a medium saucepan and bring to a simmer. When the sugar has dissolved add the peaches and simmer for 4 minutes or until they are tender. Carefully remove the peaches without damaging them and reserve the poaching water. Remove the skins from the peaches and set aside. Place a half a cup of the poaching water into a wide mouthed bowl. Sprinkle over the 1 tbsp of gelatine and set aside for a full 5 minutes to allow the gelatine to swell. Add the gelatine mixture to the remaining liquid in the saucepan and stir through. Simmer for 2 minutes until dissolved and remove from the heat. Into a well-greased 28cm x 8cm terrine or loaf pan, place the skinned peach halves, cut side up and pour over the gelatine mixture. Cover with cling wrap and refrigerate until set, about 2 hours. Test by shaking. Place the water into a wide mouthed bowl and sprinkle the 2 tbsp of gelatine over the top of the water. Leave to swell for a full five minutes. Place the cream, icing sugar and vanilla into a saucepan over medium heat and stir. Add the gelatine mixture and simmer over low heat for 5 minutes until dissolved. Allow to cool to room temperature and remove the skin that forms on the top of the cream and stir. Pour the cooled cream mixture over the set jelly and refrigerate for a minimum of 6 hours. When ready to serve, dip the terrine into a roasting dish of warm water for about 1 minute, taking care not to spill any water onto the pannacotta. Turn upside down onto a serving plate and serve with jewel like pomegranate seeds.